The phenomenon of music in its full range can be described by manifold concepts and subjective perceived features. In a nutshell these are musical characteristics. Their origins are varied from sciences i.e., physics, psychoacoustics, music theory, and musicology, or they are established by a community or culture. Generally, musical characteristics are highly versatile and can be arranged in different levels and sub categories. The classification above is taking its cue from the conceptual framework Musical Audio Mining (MAMI; see ). It is a translation of the categorisation that was introduced and fully explained in my bachelor-like thesis. It has three main types. 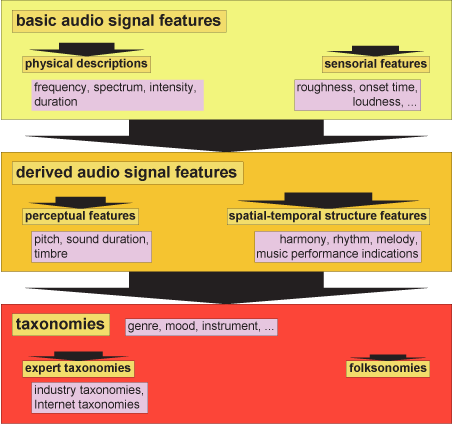 These are basic audio signal features, derived audio signal features and taxonomies. Classifications of the latter ones are derived from features of the former ones. Besides, entities of taxonomies, e.g., music genre taxonomies, can be evolved from music context data or a combination of both main types of music description. A PDF version of that figure can be found here. This graphic is freely usable and sharable under the Creative Common Attribution 3.0 Unported license. This entry was posted in description and tagged Audio Signal, Bachelor-like Thesis, Categorisation, MAMI, Music Content, Music Context, Music Information Retrieval, Music Metadata, Musical Audio Mining, Musical Characteristics, Personal Music Knowledge Base. Bookmark the permalink.